TODAY IS A GIFT: Are you an optimist? Have you seen SHREK? The American computer-animated fantasy-comedy film produced by DreamWorks. I like Shrek series and have seen all of them. The first story was released in 2001. Hey, it's been 12 years since I watched it with my family. I went to a movie theater near my house. There was a big amusement arcade that included not only a movie theater but also a bowling alley, big swimming pools, a spa and a restaurant. I heard it was closed and only that movie theater has remained. Anyway, Shrek was awesome for us. The story was funny and the music was also great. Above all, Princess Fiona was... so ... shocking. She really resembles my mom. No, She is rather the very my mom. Sorry, but not this one. She is. 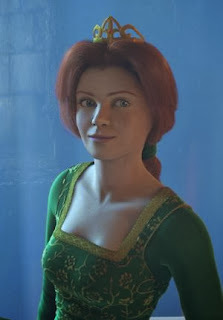 She is my mom... oops, no, she is that Princess Fiona. You'd be surprised if you see my mom. You would think DreamWorks made this character based on her. My dad was so excited to say "Did you see that? Did you see the princess? Did you see your mom on the screen?!" all the way home, which made her angry. Like as women in all over the world are, my mom also has a keen interest in beauty. She often starts the popular method of the diet, but nothing has been kept. She likes to think about to be thin, but actually doesn't like to go on a diet. Once she started so called "Cabbage Diet". The method is very simple. All you have to do is just to eat some cabbage before a meal. To eat some cabbage satisfies your appetite to some extent, and can reduce the quantity of your meal. Unfortunately, this method couldn't apply to my mom. She ate lots of cabbage before supper to reduce the quantity of her meal, but on the contrarily, it stimulated her appetite. She had another helping of rice, and furthermore, she had another bowl of cabbage. Gee, this method just added two bowls of cabbage and another cup of rice to her supper. What makes it difficult for her to continue diet is that she in fact does not mind her weight. She often told me that it would be troublesome if she lose her weight and become more beautiful. If so, a lot of guys would run up to her, and her husband, I mean my dad, would be sad. I know. She is a genuine optimist. Tomoe, you really seem to have no worries, don't you? I was often told like this by my friends. I'm gonna have a trip this weekend! =D YATTA! Hi フエルナンド, Thank you for your comment! Indeed! I want to tell them to exercise regularly and eat healthily!